Deadline for Adkins Scholarship by July 1, 2019. 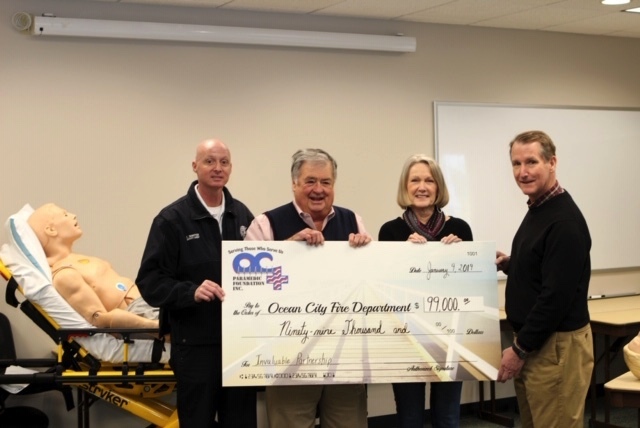 The Ocean City Paramedic Foundation is comprised of volunteers focused through fund-raising efforts on training of Ocean City Paramedics and the purchasing of equipment thereby ensuring the best possible life saving capabilities for our families, friends and neighbors. Just a few lines to let you know how impressed I was by the response of the OC EMS team on June 8. I experienced a fainting spell at church and the men on the team were patient, friendly and very professional as they helped me recover. My wife and daughter were with me and had only praise for how the team members were so supportive and made sure I was not in need of further care at that time. Please let the team know that I haven’t forgotten their service and wish them well as they continue to respond to those in need in Ocean City.